After a year and a half of lingering in limbo, Google Voice finally found its place in the app store today. The debut isn’t perfect, but it’s certainly impressive and undeniably powerful. For those unfamiliar with the push and pull of why Apple wouldn’t approve the Google Voice app initially, Wired claimed that the core of the conflict stands at the center of the services that AT&T offers. The app lets you route all of your phone calls through a single Google Voice number, offering free text messaging, text translations of voicemails, and cheap overseas rates among other features. Now that the app has finally gone through, let’s examine how it works. In order to get the app going you have to login with your Google account information. Users who already have a Google Voice account complete with a forwarding number will be pleased to learn that setup takes fewer than 30 seconds. If you haven’t set up your account details yet, you can easily do so by going to the Google Voice setup page. Here you can create a custom phone number and get your account information in order. Once you’ve set everything up the rest comes naturally. 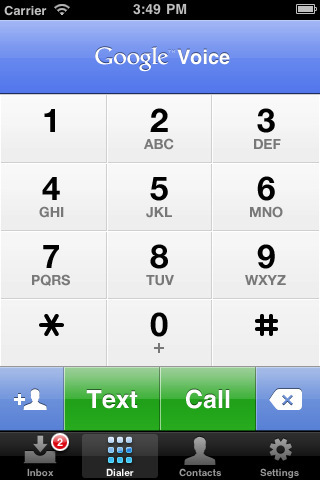 From a user perspective, the app’s navigation toolbar features Menu, Dialer, Contacts, and Settings. Inbox looks a lot like an iPhone version of an email inbox. You have access to all your messages, starred messages, history, voicemail, texts, calls you’ve placed, calls you’ve received, and missed calls. Everything is smooth and listed out in a straightforward manner, and you have the ability to delete individual calls or threads by pressing the Edit button in the upper right hand corner and then using the red minus sign to delete. Like in an inbox, you can also swipe to delete specific messages. When it comes to viewing specific messages, the Menu section contains all the details of your voicemail and text conversation threads. You have quick access to your voicemails (complete with unreliable transcriptions of voice messages) and can play messages back on demand with the play button and scrubber along the bottom. Tapping on the caller’s name lets you call them back or text them, add them to your Quick Dial menu, or show the contact’s details. 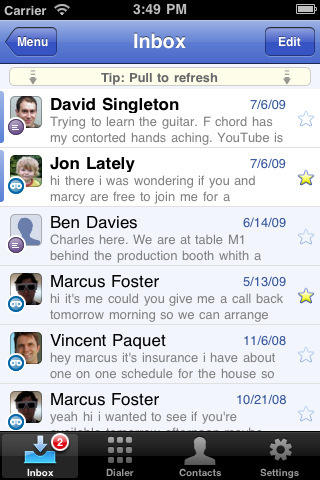 Inbox’s text section serves up a clean list of threaded accounts of your text message exchanges. The interface of these conversations with other people are structured like Apple’s text exchange bubbles, but the boxes are straight edged and definitely more aesthetically Google than Apple. The Dialer button in the main navigation gives you a traditional keyboard complete with numbers, a lettering layout, an add contact button, a text button, a call button, and a delete button. Dialing is intuitive and there’s nothing new here. The Contacts button in the app’s main navigation bar is integrated with your iPhone’s internal contacts list. This is feature is indispensable, especially because having to transfer contacts in and out of this app would be a deal-breaking pain. Just like in the traditional iPhone Contacts app, you can search for specific people and Google Voice lets you build a Quick Dial list (like speed dial). 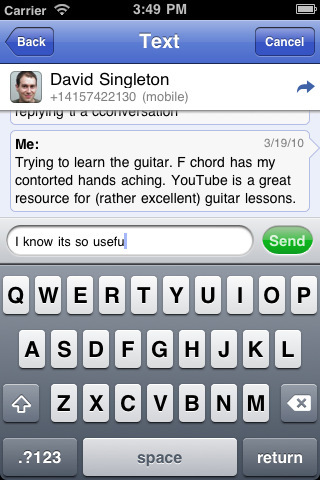 My contacts ran a lot slower in Google Voice than they do natively on my iPhone, but overall the functionality is there. The last button is settings, which is basically a technical profile hub that keeps track of your number, your account, your balance (for international calls), the phone number you’ve synced to Google Voice, and About (with help and a feedback option). When it comes to actually making calls or receiving messages, the app is fairly smooth but not without flaws. You get push notifications for messages, which is nice, but in one case my iPhone’s main screen displayed two pop up messages for the same text message. This is a small glitch, but I was able to fix it by going into settings online and stopping my phone from sending me text message alerts for new messages. If you have messages in waiting, the app’s icon displays the number of messages you have on Google Voice (much like the email or app store icon), and it’s great to know that you can always refresh for new messages by swiping down on inbox with your finger. When you actually answer a call, you press accept and the Google Voice operator asks whether you want to pick up the call or send “sometimes mispronounced caller name” to voicemail. This is somewhat of a pain, especially because you have to open the iPhone keyboard and press one to pick up the phone while it’s still ringing on the caller end, but perhaps something to get used to. If you decide to place a call, the app displays a large “Calling” box before sending you on over to your native iPhone call screen where you’re routed through an unfamiliar number. This process takes a little longer than placing your average call (we’re talking maybe a second here), but the clunkiness isn’t a huge deal considering the technicality of how Google Voice works. If you’re wondering about cost, for now Google Voice is free for domestic calls, except for the fact that you’re using up your AT&T minutes. You also have to pay for international calls, but as you can see from this site, the rates are fairly inexpensive. When it comes to texting, it seems Google has managed to circumnavigate AT&T altogether. Texting is, at present, totally and completely free. This means that you could potentially save up to $20 per month by using Google voice, but the imperfections and inconvenience of potentially using one number for voice and another for text (unless you completely switch over to Google Voice) seems too troubling for most. In the long run, it seems Google Voice won’t really hurt AT&T, at least not yet. Still, Google may have run into tough times with nearly failed releases of Wave and Buzz, but you’ve got to hand it to them this time. Google Voice is both big news and a game changer in the iTunes app store. Bottom Line: It’s finally here. Google Voice delivers a mostly smooth integrated calling experience for the iPhone. The app isn’t perfect, but it’s pretty close considering the technicalities of how the system works.